A combination of childlike curiosity and jet laggy sleeplessness pressed the more adventurous of us out into Tokyo's streets at 3:30AM for random exploration goodness. After wondering the winding and narrow roads, and being propositioned for many a "special massage" in Roppongi, I noticed this gem in Higashi, a Mitsuoka Galue-ii. Say that three times fast. While it looks stately and elegant(ish), I was confused by the cloth seats and frightening parking spot. 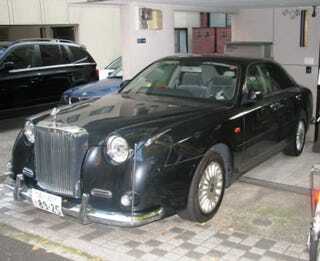 Feels like an uneasy cross pollination between a Bentley Azure and a Rolls Royce Silver Cloud. I felt it rude to walk into someone's garage, so there's only one more shot after the jump.